Firearm-related homicides declined 39 percent and nonfatal firearm crimes declined 69 percent from 1993 to 2011, the Justice Department’s Bureau of Justice Statistics (BJS) announced today. Firearm-related homicides dropped from 18,253 homicides in 1993 to 11,101 in 2011, and nonfatal firearm crimes dropped from 1.5 million victimizations in 1993 to 467,300 in 2011. For both fatal and nonfatal firearm victimizations, the majority of the decline occurred during the 10-year period from 1993 to 2002. 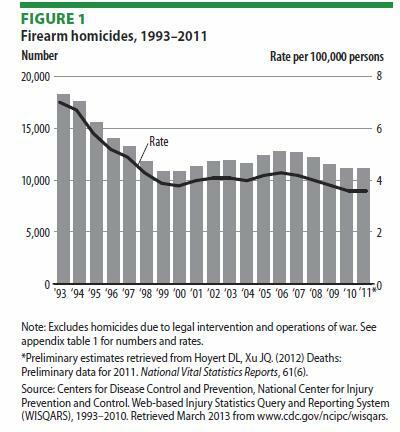 The number of firearm homicides declined from 1993 to 1999, rose through 2006 and then declined through 2011. 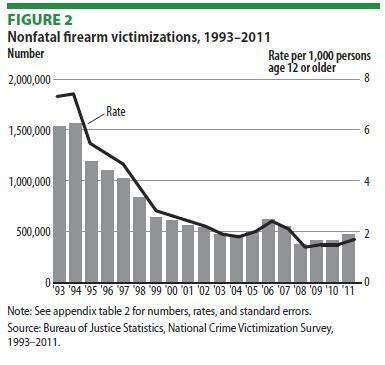 Nonfatal firearm violence declined from 1993 through 2004 before fluctuating in the mid- to late 2000s.